Your complete quick guide to connecting your keyboard. If you are just starting out with your home recording studio set-up, the first thing you may wish to do is find out how to connect a MIDI keyboard or digital piano up to your computer. This will enable you to use any interactive MIDI software products: quickly record virtual instrument tracks; write your own songs and music; learn to play and more. The MIDI Keyboard is often the heart of a small home recording studio, and the easiest and fastest way to enter bass lines, edit drum tracks, and of course record keyboard tracks. The other benefit of making a MIDI connection is if you want to learn to play keyboard or piano. Once you have a MIDI connection you can benefit from interactive piano lesson software and online piano courses. It is also a great way to benefit from interactive music theory software and apps. The quickest and easiest way to connect is using a USB-MIDI interface like one of the high quality branded devices below. Our Top 4 choices For Simple USB-MIDI interfaces which work! Roland UM-ONE MK2 USB MIDI Interface High-performance FPT processing, very compact, affordable, and easy to use. Compatible with PC, Mac and iPad. We advise that you always stick with a well-known brand which is why we recommend any of the above. They all have good manufacturer support, up-to-date drivers and good guarantees in the event of any problems. If you want even more choice, then you can follow this link to find the current top 10 most popular MIDI interfaces. Although you can get other kinds of MIDI controller, the keyboard is the most popular, widely available, and reasonably priced. If you have not yet got any kind of keyboard, then look first at Getting started – choosing the right keyboard. It will help you decide the best MIDI keyboard for you. Want To Record MIDI and Audio? If you not only want to use your keyboard or digital piano as a MIDI controller, but also want to record the sound of it, then do look read our post on how to record your keyboard. There are lots of recommendations in there for kit that will let you do BOTH. And put your keyboard right at the heart of your home recording studio. Let’s start with your keyboard or piano. You first need to establish that it has got a means of connecting with your computer. Look to make sure it has a MIDI port. MIDI (Musical Instrument Digital Interface) is the protocol for communication between your keyboard and your PC. When you press a key the action is registered by the software you are using through the MIDI link. Most keyboards and Digital Pianos have MIDI in and out as standard. Look for ports like the one in the image below. 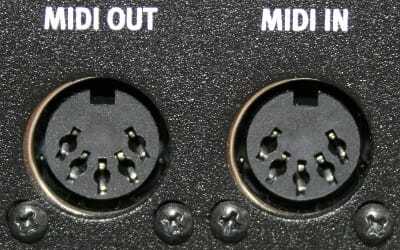 Some soundcards come already equipped with MIDI ports like the ones shown above. If that is the case, all you require is a MIDI Cable 5 pin to 5 pin 3 metre . Some of the newer keyboards now have a USB MIDI port – all you need is a standard USB cable to connect directly from the keyboard to the USB port of your PC or laptop. The accepted way actually makes a lot of sense. Think about it. You want MIDI data to go out of your controller and in to your sound module. After all, you wouldn’t connect the audio out jack of your sound module to the outputs of your mixer, would you? No, you connect the audio output to an audio (mixer) input. And then you connect the mixer outputs to the inputs of your amplifier. And then you connect the amp’s speaker outputs to the speaker inputs. Same thing with MIDI. Think of MIDI data as “flowing” in the same way that audio signals “flow” through your audio system. Still Confused? Or Want To Record Audio Tracks? This is just a quick guide if you simply want to hook up your keyboard to start using MIDI software. If you want a more in-depth set of tutorials, or you want to record the sound of your keyboard then you can either refer to our quick guide on how to record your piano, or see our full length free video course which explains the difference between MIDI and Audio in detail and shows you step-by-step exactly what you need to either record your keyboard or use it as a MIDI controller. Jane i have an Evolution mk 149 midi keyboard with just the out midi port and am using the midi to usb cable to connect it to my laptop on reason software but still its not responding and i have made all settings. Its so frustrating what do i do please? Can i connect my soundmodule to these new keyboards via the usb host to usb host connection which i have not yet seen as standard cables? Hi, Can i use a usb keyboard as midi controller without an external audio interface ?? yes you can, you do not need an audio interface just to use a USB MIDI Keyboard Controller. So i have a program for sound from my Macbook Air… My keyboard has a (usb a female) and a (usb b female)… If i buy one of those would i still need a audio cable connecting my headphone jack to an amp or is that only for when u connect the Macbook air and keyboard with a Usb-midi cable? If i buy a (Usb a male to usb a female) or a (Usb a male to usb b female) would i still need a audio cable or no? hi. i’m a beginner at this. i own a casio privia px150. when i connected this to my laptop there was a latency problem. is there anyway i can avoid this? i use ableton live 9.5. I’m a bit of a luddite (I’m not saying which bit) when it comes to playing music, having started out on Hammond organs and until now, never having anything to do with midi. I have a Yamaha PSR540 now and have always wanted to add a bass pedal board so I can play my own bass lines, rather than rely on the automatic accompaniment. I recently acquired a Ketone K8 pedalboard and after connecting the midi cable to the pedals’ ‘out’ and the keyboard’s ‘in’, then blundering about with midi settings, managed to get the pedals to make a sound come from the PSR540. Yay! Unfortunately the only sound I can get it to make is the Yamaha’s 001 – grand piano… I have no idea how to assign a different sound to the signal from the controller – the pedals… Any ideas? Hi, you will have to look into the manual of the two devices -thed pedalboard and the keyboard. You might want to look at whether you can adjust the channel that the MIDI signal is being sent on from the pedalboard, or how to adjust the patch in the keyboard. Good luck. i’ve been using an ICON MidiPort connector with my Roland EM-15, whenever I play a key or try to do anything on my keyboard my laptop doesn’t recieve anything at all. I dont know if it’s the software I’m using (Mixcraft 7) or the drivers for my MidiPort but I would really like to know why this isn’t working. My Yamaha s90 xs is not coming up instead it is saying firmware update… usb memory not found. Think you are going to have to contact Yamaha support for this one …. ! Hey. My keyboard has only one port: Midi out. Will it work without Midi In? can i connect a midi controller to focusrite scarlet 2i2? The 2i2 does not have MIDI i/o. You will have to connect your MIDI controller to a different USB port on your computer. The two devices will work fine alongside eachother. I have a Yamaha P-150 midi keyboard, and I recently bought a mio iConnectivity interface to connect it to my MacBook Pro and use with Sibelius. I’ve checked in Sibelius Preferences and it finds the keyboard, but when I play notes they don’t register. The test light doesn’t come on either. Very frustrating! I have a small USB keyboard too, which works fine, but is no good for recording the piano music that I need to. Any help would be greatly appreciated! Thank you. Hm, doesn’t sound right, try contacting the manufacturer/supplier for support, the device may be faulty. I want to send MIDI data from my Macintosh to an old Yamaha TX81Z synth. I have an interface (Midisport). What software do I need? Thank you. It depends what you want to do. You could start with Garageband? Hi Jane, I have some old instrument stuff that was left by my brother. Idont know how to set this up. my question is how can i connect the laptop with a vst software to sc880 into m-audio? and please give me a suggestion that i can link all this stuff together. im new to this and i have no idea how to set these up together. Connect the Oxygen up to HP laptop and use as the MIDI controller. You can just use the USB connection. Then use DAW software and output to the Roland using the USB-MIDI cable. Get that set-up working first and see how you get on. Hi Jane!! I’m a newbie to the world of MIDI. I’m interested in purchasing a PSR keyboard from Yamaha (either a PSR-S970 or a PSR-S950). My query here involves the playing of MIDI files of which I have quite a number mostly downloaded from the internet. They are on a USB stick in files by genre and then by artist/band. They also exist on my computer in the same manner. Which is the better way to connect to the PSR–computer or USB stick? Also, will the screen on the PSR see the current files in which the MIDI’s reside and then open the files to reveal the actual .mid I’m searching for? Can I also accomplish the following: can I mute a midi channel on the PSR and be able to play along with the midi file with, say, a grand piano patch or even a keyboard split? Can I change the overall key signature of the midi file on the PSR and also have the “live” patch on which I’m playing transpose as well? Enjoying this blog immensely, and, many, many thanks!!! Hey! I have a kawai CN23 digital piano, and when I hook up the midi to usb to my macbook and go into garageband, the sustain pedal is registering as a note! As soon as i touch it it registers as a held E note. I can’t get sustain to work at all. Any suggestions? I recently purchased a Yamaha MX61 keyboard. It has a great tone generator for live performances and then some. I want to use it as a midi controller; so, I connected it via USB to my MAC. I don’t know what I’m doing wrong. I keep hearing the Internal Keyboard sounds & the software plugin/vst’s. I simply want to use Kontakt and have my board as the controller. I don’t want to hear the internal sounds that the keyboard produces. I want to use the software. Also, would the sound then have to come from the headphone port on my MAC? Where are you hearing the sounds? Just from your keyboard? If so, then check the manual for your keyboard because I think there will be a setting to turn the local sounds off. Then you should just be able to use it as a controller. If the sounds are coming through your mac speakers from your keyboard then…. not sure what is happening! You sure you are creating instrument/MIDI tracks not audio? Think you might have to post specific questions to Yamaha support. I have yamaha psr540. this records in xg midi format which does not seem to migrate to pc inact with my host cable, although i did buy the cheapest one under $5. should i buy the more expensive cable to make the xg come across, or will that not work regardless of the quality of cable. it is a twin midi cable likethis one…. I would recommend buying a branded one, one with good manufacturer and tech support. The problem with those cheaper interfaces is they can be unreliable and unsupported. Try the Roland UM-One, I have one and it is so reliable! Jane, I am trying to use my Yamaha P255 to communicate to Finale software, specifically to use the Hyperscribe function in which you can play on the keyboard and the music is notated directly in the software. 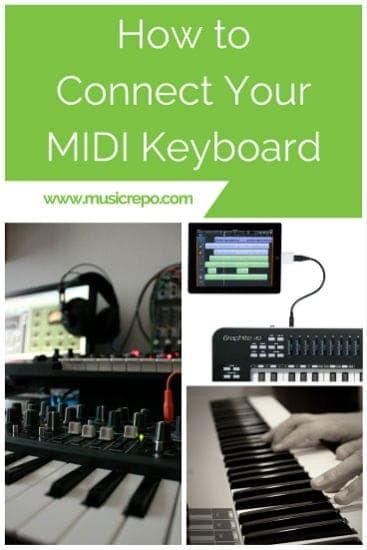 I have the M-Audio USB Midisport Uno MIDI Interface that you mention above as being one of the better midi interfaces out there, and have connected it according to these instructions. Still nothing happens. Any additional ideas? Well if you want to try something for free, then Presonus Studio One is completely FREE! Reaper is very good, and you can get that on a 60 day trial. Then if you like it the price is very reasonable. Mixcraft is also fantastic if you are quite new to all this and want something easy – you can try a free trial of that. Hi Dave, try our article on testing a MIDI device, which should help you troubleshoot. If the keyboard is working OK in MIDI Ox (or MIDI Monitor if you are on Mac) then you need to go to the manual for the software and make sure you are correctly creating a MIDI/instrument track not trying to record audio which you won’t be able to do with a MIDI interface. Hope that helps. Hi. I have an old roland mk II midi controller. I’ve never used one before it just happened to be in my house.How can I connect it to my computer? Can i just use the usb-midi cables u mentioned above? My mom bought me a Studiologic SL-990 pro Midicontroller, and I have no idea what to do with it. I’d like to be able to use it like a keyboard, but I have no idea what software I would need to make that happen. I had a macbook and still have a midi-usb cord, which worked great with Garageband–you just plug everything in and away it goes. Now that my macbook no longer works–the most recent update made everything slow down to a point where nothing functions–I’m back to a laptop PC which doesn’t have anything analogous to Garageband. Any suggestions you can provide? I’d ideally like to just be able to download something from the internet rather than hunting something down in a store. I have a Korg X5 that I have had for 15 years with the intention to learn how to play and to create music. I will be 50 May 31, 2016 and decided I am going to follow my passion for music, peace, unity, illumination, etc. through my photography, videography, and music creation. The problems is not my passion it is knowledge. I have a Native Instruments Komplete Audio 6 (A6) as my audio interface. I have plugged my microphone into my A6 and Ableton recognizes it. I wanted to use my Korg X5 (X5) as a midi controller and thought it was as simple as plugging a midi cable in the MIDI OUT of the X5 and into the MIDI IN of the A6 and I would be in business, but I could not get the X5 to trigger the keys in Ableton Live 8 or Native Instruments (NI) Kontact 5 or any of NI’s software found in the Komplete 9 Ultimate package. I know I am so close to starting my music creation journey but I am stuck for I do not have the financial resources at this time to buy a controller listed on lists inside Ableton plus I have read lots of people using the X5 as a controller. Question 1: When plugged into the A6 do I still need to have Drivers for the X5 to be recognized by Ableton Live 8 or the NI products. I am running these programs on a Toshiba laptob with a CORE i7 processor and 8 Gigs of RAM. The last drivers Korg made for the X5 only worked for Windows NT, Windows 2000, and one other version of Windows but I am running Windows 8.1 64 bit and cannot install those drivers. Question 2: Does my A6 act as an interface that passes the MIDI signal from my X5 to the DAW and other packages through the USB connection of the A6 thus bypassing a need for drivers for the X5? Question 3: If it does not, besides changing the internal settings on my X5, that I have followed to the best of my ability from the Korg X5 & X5D User Manual (page 11), what else do i need to do? Thank you for your time and any guidance you may provide. If you get all that working and you then wish to play back from the laptop to the keyboard and you are getting overlap of sound from the Echo Back then you will need to set Local Off on the X5 – this disconnects the keyboard section from the internal tone generator. However, when you play the X5 in standalone mode it won’t make a sound until you turn Local On. Hi, yes, just a standard USB printer cable, check your keyboard’s manual for further instructions on how to get connected. I have casio CTK-1200 , and theirs only a jack plug to use midi out. How can i connect it to my windows 8 pc to create a music ..
Hi Melrick, I don’t know this keyboard and couldn’t find the model on the Casio site either to look it up. Does it seem to have USB connectivity or just MIDI. If it is USB then it should work as a controller and details will be in the manual. If not then you will need a MIDI interface to get it to work. Buy a branded one that will work well on Windows 8 if you can. I’m sure this is answered somewhere here but I couldn’t find it…. I have a Mac running Os X 10.10.2 and a Yamaha keyboard that’s several years old. I just want to connect the keyboard to the computer to use with simple software (Piano Wizard, Music Learning Community – no recording of sound) but I can’t get the computer to recognize that the keyboard is connected. Can you help me? Update…. the computer sees the keyboard but doesn’t register the actual keys I’m playing. I just get the ‘sound effect’ tone. I have a Yamaha NP-11. I have a MIDI usb cable that is connected as far as I can tell on my Mac. I want the sound to play through my computer speakers where I can then use wireless headphones to listen to me playing. I hope this makes sense. Hi Shawna if you want to get this result you will have to use your NP-11 as a MIDI controller and get some software with software instruments to play back through your speakers. Have you had a look at Reaper, you can try that out for free. Create a virtual instrument on a new track, select the TTS-1 which is a general MIDI instrument, arm it for recording and you should be able to hear yourself. Hello, can I use the keyboard (that has General MIDI function) with an Audio Tracker, and play the notes directly from the keyboard? I am not sure which software you are referring to, exactly, but if you have connected your keyboard up to your computer correctly, and the audio tracker software has MIDI functionality then yes you should be able to use it as a controller. Hi Jane.. Im a developing pianist.. I want to know how this connection helps.. Does it do auto transposition? Where do you download softwares to record & does it record piano only or all sound frm mixer too? Hi Jane. I just bought a used Yamaha Portatone 310 in hopes to use it as a base board to utilize voices from garageband and Wavelab le7 on mac and FL studios on pc) It has a midi in / out. I am trying to run it through an Alesis IO2 which it has both midi in / out, and it (the alesis) is equipped with a usb B port to feed pc or mac. So far I have seen lights and had sound to the Alesis, but I have not seen any indication of recognition through eithr pc or mac nor any programs I am running. I have only attached one midi cable from the yamaha to the Alesis. Neither my pc or mac are even recognizing anything is plugged in. I am running Wavelab LE7 for a program. Do I need two midi cables? The IO2 should be a plug and play device. Try connecting it directly to a USB port on computer, not via a hub. If it doesn’t appear to be recognised by computer try a different USB cable – 99% of the time this solves the problem. You need to establish that the IO2 is working and being recognised by the computer before going any further. Look in your control panel (windows) or system preferences (mac) and make sure that the IO2 is showing up as an available audio device, then set it to the default. Only start up your recording software after you have checked that the IO2 is being recognised. Don’t start up the software then plug in the IO2, do it the other way round. Finally it will be a choice of making sure that the IO2 is being chosen as the recording device in the software preferences, and checking the MIDI preferences to use the MIDI on the IO2. I have had to renew my PC. And can not get my Yamaha YPT-210 to play, anymore, on my PC. I am using Reaper software. I have a midi to USB cable. However I do not remember what make it is ! Therefore I can not download the necessary software to get it to work. I presume this is why I can’t hear anything through my PC ? Many thanks. I will save this link. It now works again ??????????????????? Anyway as I have got your attention, could you please let me have your opinion of Mixcraft ? As I am thinking of buying it. Glad to hear it is working, even if the reason why is a mystery. I love Mixcraft v6, it is such an easy product to use for beginners and it is really well featured. You have reminded me, I should check out the new version and see what’s new. Good luck with your recording etc. I have a bit old keyboard Casio ca 110 tonebank with no midi out just an audio out . Is there any way to connect it to my pc ? No, not possible to make a MIDI connection if it has now MIDI port. You would only be able to record the sound. I have a novation launch key midi interface, focusrite pro 24 audio interface , connected to a MacBook pro running main stage. I want to use a roland RD 700 as my main board, then use the launchkey assignable encoders to control the functionality of main stage. Can I connect the RD 700 to the mac book via usb and the novation to the MacBook via the other available usb on my macbook. pro. Hi! 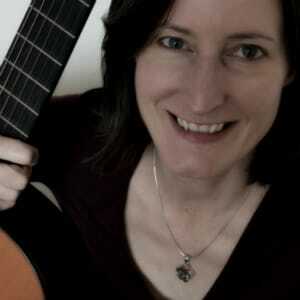 Jane I’m glad I found this website for posting queries regarding midi. I’m using Roland Spd-30 percussion controller. Mam I tried Spd-30 hooking up to PC with Sonar DAW. I’m able to trigger vsti plugins but, is it possible to trigger Spd-30 onboard tones from Sonar ??? Spd-30 has Midi In/Out and Usb-Midi Connectors. 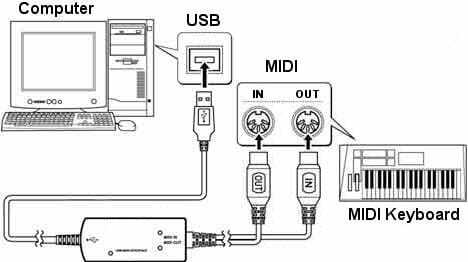 I use a simple ” Pc-Usb to Usb-Midi ( like Printer Port)”. Can u please help me to find the solution. Thanku Mam. I noticed your comment awhile back to avoid the M-audio keystation since they removed the DIN midi ports. Well, I have the Keystation49 and was hoping to use it to run an old QSR sound module I just picked up. Other than the iconnectMidi4 (rather not spend $200), I was wondering if there’s an interface that goes from keyboard USB to sound module MIDI DIN? As I think about it, I’m doubtful since I guess there’d be nothing to power the USB? I suspect what WON’T work is: using an M-Audio Uno “backwards” (in reverse) with a USB A to USB B adapter. Your thoughts? Thanks for being such a great answerer of questions!! Ive just bought the Casio CTK 6200 keyboard, it has L/mono and R output on the back…if i was to connect this to my Peavey XR1212 mixer desk, would i be ok to just come out the 2 output of above on my keyboard and into 2 individual channels on my mixer?and on doing this would i leave the pan controller on each channel of the mixer central or would in need to pan left on 1 and right on the other?…i was messing around with it last night and just simply plugged a cable from my phones output of the keyboard to the desk and it worked fine but im not sure this is the right way to go. Hi Stu, if the output from the headphones works ok and does the job for you then why not? However if you connect L and R then you can adjust the volume etc of each individually and the positioning in the stereo field. I received a M-audio Axiom61 as a gift upon my request if somebody could donate a keyboard for one of my talented little piano students who does not have the funds to buy one herself…and now I need to try to set it up for her. So; we have a talented and motivated little girl of 6, we have the keyboard, and we have a laptop that runs on windows XP…and we are trying to find a (as simple as possible way and if possible with free software) to get the keyboard making piano sounds when she pushes a key so she can study… any ideas what is the best way? What will be the simplest way to get some sounds after hooking my controller to pc ? I know a DAW is a solution but, is there a simple software just to play the controller ? Hi Julian, there are a lot of stand alone players out there, for example the Native Instruments Kontakt Player and the Garritan Sounds player. Have a look to see if those would help you achieve what you are after. I will take a look at those, Thanks Jane. Hi Jane I am trying to run edit track through a emulator called Steem for my son’s grandfather who at the age of 65 still plays live gigs using midi files . I am trying to put all this on a laptop for him unfortunately I can’t get reverb and chorus to work . I think I may need a good sound card . Can you help please . Thank you very much for your expert advise Jane . I have a Casio Privia PX-750 piano with a usb interface. Is it possible for the computer to send midi notes to the casio and have the casio play the notes using it’s built-in sound engine? So far, when I play a song on the computer, it seems like the generated sound is created by the computer’s sound engine and not the piano (ie: changing the instrument type on the piano doesn’t change the sound of the song). Hi Jane, i have this old MIDI keyboard called MC-49, it does only has a MIDI out and no MIDI in. I was wondering if i’m still able to converte the sound from the keyboard to my computer through an MIDI to USB cable like the M-Audio Uno? Hi, I don’t know the keyboard, is it just a controller keyboard? If so, then you won’t be able to transmit any sound because it doesn’t make any. If it is a keyboard with onboard sounds then a MIDI-USB cable will still not be able to transmit any sound, only performance information. Is a midi cable and USB cable the same thing? Bought one at Staples and sound to the piano marvel program is not going through. Any thoughts? Hi Jane, I gave a Yamaha keyboard and I have a USB midi interface. What software should I get to add synthesised sounds like a piano or a drum kit so its mapped onto my keyboard? Hi I have a Casio wk-1630 (really Anciant) and on both my pc and laptop data doe’s not seem to be transferring in. At one point if I clicked on the piano grid on my software the sound from my pc would play on my casio speakers but the data notes do not play from my casio to my pc so I cannot record midi. I have tried acid pro 7 and FL 10 but I still cannot get the midi to work. (by the way it’s a midi to usb) I am stuck I don’t know if I should buy a new computer, a new keyboard a sound card or what… I just purchased Pro tools express to now try that but it will arrive in a few days. Tell me if I make sense I’m am new to midi recording I always used audio recording for real instruments just mics and imputs, so please help! If the answer was above, I’m really sorry. I’m trying to play MIDI data from my computer to my keyboard so I can see the keys light up.. That’s it. I own a Casino Lk-165 piano and a Windows 8 computer. I have just purchased a Korg Volca Sample which has annold style Din midi in connector. Do you know of any cable or convertor that will allow my M-audio oxygen 25 usb keyboard to control it? If possible I dont want to use a computer in the setup. Thanks for your help. Can you recommend a small keyboard (with big keys) that might provide old style midi out? Thank you Jane. I really do appreciate your response. I use “Audacity” as my DAW on a Ubuntu-Linux Dell. I can import MIDI into Audacity. I will take your suggestion and get a MIDI-USB interface. The example you showed at the beginning of this forum looks like it will do the trick. Thanks again. Hi I am kiran. Now I am going to buy one new keyboard. I have an old one with normal midi in/out. I connect it to scarlett 2i4 audio interface and den to pc. In most of the new keyboard models I find only usb midi port. which is good?in terms of latency/jitter, speed,…… normal midi to pc through audio interface or usb midi directly to pc? Hi Kiran, I think if you can find a keyboard with a MIDI port not just USB then you will be better connecting it through an interface – but this will only be very marginal. I use a USB keyboard alongside my interface because it doesn’t have MIDI, I only have a very average laptop and I do not seem to have any issues with latency from the controller. So if you have a choice go with the interface route, but if you don’t I would not get hung up about it! Hi, I have just purchased an 88-key Alesis MIDI Keyboard Controller, and I cant get any sound from it. I have tried to connect it to an amp and use headphones, but no sound will come out – and then I connected it to my apple mac, and used the software that came with the keyboard – which is: Ableton Live Lite Alesis Edition software, but I still couldn’t work out how to get the sound. Thanks for your time, I really appreciate it. I have window 8 pc and midi controller goes under other devices (it puts it under printer group). How can I have midi show up under audio/video/game tab (under device manager). as of now midi keyboard is not working. Thanks for any input. Hi, if your controller is not being recognised correctly and it is supposed to be class compliant then it may be that your drivers that should be build into Windows 8 are missing or corrupt. There is a link here to a good step-by-step guide to diagnosing and then troubleshooting, and at the bottom there is a link to the audio codec you may need to download and install if this proves to be the case after working through their suggestions. Hi Jane, This is the first time I’ve visited this web site. You seem to have helped people here with a similar problem that I have. I wonder if you can help me? I have a Quickshot Midi Composer keyboard. It is a midi-controller and sends midi out that can be received by computer sound cards. This technology is 20 yrs old. It’s two connection methods are either a midi output (requires a midi cable male-to-male) or a game port output (15 pin game port cable connector also male-to-male). I no longer use a desktop computer. I use a Dell laptop that only has sound card inputs via mini-jack access. My problem is finding an adapter that will work in either case. I’d rather use the mini-jack “line-in” to receive the MIDI controller signal from the Quickshot Midi Composer keyboard, because it would be direct to the sound card. I saw your example above that suggested a MIDI cable to USB connection. Is that the only option available? Will the MIDI controller signal reach the sound card through the USB connection, without modifying the signal values in any way? Thank you for your time to answer this. I appreciate it. I have all kinds of sheet music books and a new Casio PX-780 Previa Digi-Piano. I also have a laptop and a scanner. Is there anyway to get the Piano to play the sheet music I have? my midi keyboard’s usb port is broken and there’s only a midi out port. If I buy a midi to usb cable will I still be able to use it or do i have to get it repaired? hi, may I know if for an instance I have a digital piano or a synthesiser and I connect it to my computer and use the MIDI software. am I able to change how my piano sounds like while using MIDI? I’ve seen some covers on YouTube and some of them have really good piano sounds so I was wondering if it was possible for me to change how my synthesiser sound like as I do not really like the default piano sound of my synthesiser and there aren’t other built in piano sounds that are to my liking. I’m using a korg m1 so it’s a pretty old model. Thanks for your time! Hi, yes you should be able to pick any virtual instrument you like in your software and use your Korg M1 to control it, as long as you have made a suitable MIDI connection between the Korg and your computer. Hi, This is Subhro here. I am using Yamaha PSR S710. Though i have been playing for a long time, i am a little weak in technicalities. I have a lenovo laptop, using windows 8.1 as the OS. I just want to connect my keyboard to the laptop and directly record music? Please help me. Hi Jane, I have been stuck with this problem for a very very long time and searching online hasn’t provided an answer for me yet. I have a CME UF6 keyboard that I have had for a few years and would like to start using it again however unfortunately the company stopped providing drivers for it a while back and no win7 64 available so I can’t use it via the usb cable. However there is a midi out port only (no in port), is it possible to still use this keyboard with windows 7? My sound card is the Edirol UA25 which has midi in/out but as there is only a midi out port on keyboard I couldn’t get this to work. Jane, there are a lot of Audio/MIDI interfaces to choose from. But if a MIDI keyboard or controler can be hooked up directly via USB why would anyone want or need to buy an interface with MIDI built in, such as the focusrite Scarlett 2i4, etc.? Been having this issue with my MIDI keyboard for sometime now. My computer and Pro tools/Logic recognizes the keyboard but for some reason after I connect it, I’m able to play only a 2-3 notes before the signal gets cut and no sound comes out. The DAWs do not recognize the signal too. If I restart my keyboard the same thing happens. ANy ideas for a fix? Hm, sounds like you may have to contact the manufacturer of the keyboard to get some support on this, if it is dropping out. 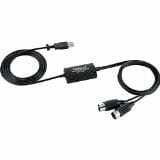 If it is a USB keyboard, then try a different USB cable as sometimes they can fail. hi, i have piano… sk-9004 shen kong and i want to connect it with my pc..it gives me only midi out and not midi in…and the cable that i have don’t work…what can i do..? Make sure you have connected the cable correctly (connect the in of the cable to the out of the keyboard and vice versa). If it isn’t working then, you will need to seek support from the manufacturer of the USB-MIDI cable to make sure it is functioning correctly. Sometimes they just don’t work – especially the cheap unbranded ones. I have Yamaha MM6(it has MIDI I/O & USB) & Cubase AI 5. I am purchasing Focusrite Scarlett 2i2 USB Audio Interface. 1) If I purchased Focusrite Scarlett 2i4 which has MIDI I/O how can I use its MIDI I/O with my Yamaha MM6? 2) Connecting Yamaha MM6 to Focusrite Scarlett 2i4 via MIDI I/O and Connecting Yamaha MM6 via USB directly to laptop are these two things same. 3) If I connect Yamaha MM6 to Focusrite Scarlett 2i2’s one of input channel and record it to Cubase can I edit the sound later same as that when we connect keyboard directly to laptop (for e.g.- I recorded Strings, can I later edit the voice/tone to pads or different voice). 5) Is Yamaha MM6 a MIDI Controller or Workstation or Synthesizer? “The accepted way actually makes a lot of sense. Think about it. You want MIDI data to go out of your controller and in to your sound module. After all, you wouldn’t connect the audio out jack of your sound module to the outputs of your mixer, would you? No, you connect the audio output to an audio (mixer) input. And then you connect the mixer outputs to the inputs of your amplifier. And then you connect the amp’s speaker outputs to the speaker inputs. Same thing with MIDI. Think of MIDI data as “flowing” in the same way that audio signals “flow” through your audio system”. Through which stages exactly this MIDI “flow” travels is exactly what I fail to grasp. I’m aware that each MIDI connection has 16 MIDI channels – likened to 16 different musicians, somewhere online. I also learned that Channel 10 is usually reserved for percussion. But for the life of me, I have been unable to unearth which instruments the other 15 are relating to. So if I want to play some virtual musical instrument, on my MIDI controller, are Channels the right place to begin? And if so, how to decide then which Chanel would be suited to (or suitable for), say, this trumpet,of my previous contribution? And, following up on this, in what manner do things like Program Changes and Banks fit in? Hi, the channels do not relate to instruments – except that channel 10 is usually related to percussion. What you can do is select different ‘patches’ (instruments) on each individual channel so you can have an ‘orchestra’ or ‘band’ of up to 16 voices. The voices can be anything you care for and limited only to the instruments you have available within your software. So in your SOFTWARE you need to load in any instruments you have available, select the channel and then output to that channel from your keyboard. You can send program changes within a track which will change the instrument or patch to another one. Might you be able to shed light on on some difficulties currently experienced? I own a brand new M-Audio Keystation 88 MkII, MIDI Controller, since a couple of days. I’d like it to play Garritan musical instrument sample (in Aria) – preferably as standalone on a Windows 7 laptop. And playback of this I wish to capture – not on some DAW, but on my Zoom R16 digital 16-track recorder. The biggest hurdle, has been setting up MIDI, on Keystation 88,. Wouldn’t it be nice if MIDI could play the test trumpet loaded in Aria? But no luck at all, so far. I’m relatively new to the concept of MIDI and, hence, unsure where exactly to begin. The manual coming with the Keystation is frustratingly basic, in this regard – thus adding considerably to already great confusion. I had hoped to make some music, these past five days; instead, those were spent attempting to dig up, online, some tutorial explaining – to absolute newbies (like me) – from where exactly to start and how to move forward, step-by-step. But wherever I looked, I was pelted with horrendously impenetrable gobbledegook – without exception. Would you know, perhaps, as to whether something akin to ‘MIDI For Dummies exists? Hi Peter, have you tried visiting the Garritan support centre where they appear to have lots of manuals and a forum where you could post specific questions about the software? I have a 12 year old son getting better at music & singing. I am now buying him a Roland E09in. However he wants to record his singing on his laptop for playing back later. Would a Mic & a DAW like Audacity along with the Roland E09in suffice for this requirement? Or anything additional is required? Hi, I think you are also going to need an audio interface so you can record the keyboard and the voice. Get one with line in (to connect the Roland) and mic in (to connect the mic). For just simple recording of different tracks, Audacity would be good. Most branded interfaces also come with recording software as well. If you purchase an interface, make sure it has phantom power if you want to connect a condenser mic. You’ll then just need the right cables and a set of headphones. Sorry if this question was asked already, but, on most desktop computers, the sound card has a “game/MIDI” port that is a 15-pin interface. How does the keyboard connect to the desktop PC with this type of interface/port? Hi Darren, the old gameports are no longer used on modern computers, but you may find older ones that have this. It used to be possible to get a MIDI-Gameport cable which would allow you to connect a MIDI keyboard. I used to sell them, but eventually the supply dried up. However, you might, if you scour secondhand sites, be able to come across one. Hope that helps. Hi, Im a little confused with this usb midi cable. My friend has a casio keyboard and has one lead that is a midi that plugs into the keyboard and the other end is a usb that plugs into the pc, and then he plays the keyboard and it records using a daw prog on the pc. no issues. Now, im looking at getting a yamaha psr e 303 and im struggling to find a lead. The only ones seem to be the ux16 that has some type of interface and two leads coming out. Dont understand why i can t find a single cable with the round midi plug for keyboard and a usb on the other end for pc just as one cable. I am looking at buying a Yamaha p105 digital piano. I want to be able to hook it up to my computer to layer my music. It only has a usb port for midi. Will I be able to play a song and record it to my computer and then play it back and put another layer on top? I would like it to feel like I am playing with another musical instrument. I have My old keyboard KORG X5D but loved to sounds of new machines, say, Roland RD 800N or Motif xs, or Kronos. and to own them is only by dreams. Is it possible to hear their sounds in my one and only KORG X5D using a midi controller? please…. Your Korg X5D has the sounds it has. You could use it as a MIDI controller and then install virtual synths on your computer to expand the sounds available to you. But I don’t think you are going to directly get your X5D to sound exactly like the Roland or Kronos. Hi I’m used to sending midi data from my laptop (Sibelius First software) to a keyboard’s midi in port so that the keyboard plays the score. However, looking for a new keyboard I see that they don’t seem to have midi ports any more – most just have usb to device, which I guess means they don’t receive midi data. Are there keyboards which will receive and play midi inputs? If so, what connections are used? Hi Andy, I think there are still plenty of keyboards available with the standard MIDI i/o as well as USB. So as a start, take a look on the Korg site, nearly all their keyboards and synths have MIDI in and out. You’d then just need a USB-MIDI interface to connect them up and select that as the MIDI device from Sibelius. Hope that helps. OMG!!! I LOVE YOU JANE!!! I spent almost 2 weeks trying to figure out why my keyboard wasn’t working I was about to take it back and buy another one and for some reason I decided to google one more time and came across this page. Now I feel stupid because I thought it was hooked up right the whole time. Anyway thanks I owe you one. Do I really need a studio sound card to play a MIDI keyboard? You can manage with the standard sound card built into your laptop, just as long as you have an appropriate USB-MIDI connection from your keyboard. Obviously a studio soundcard will give much higher quality results, but for getting going, no, you can manage with what you have already got. I have a quick question. I have purchased the RME Babyface D A Converter and it comes equipped with the older style 5 pin midi in/out. My keyboard, a simple YAMAHA, only has one USB type B port. I have previously connected the keyboard to Garageband DAW on the laptop via USB, just using the downloadable driver from Yamaha and it seems to be running fine. Is there an advantage to connecting direct to the Babyface apart from the fact that I will use less USB inputs? Should I need to change anything to utilise the midi input on the Babyface. What is the best type of cable to buy? It should all be plug and play should it not? I Would appreciate your advice. Hi Jane! I have a problem, I have an old midi keyboard controller ( that keyboard has only Out Put midi ) that I wanna connect to computer, so i bought a midi usb cable that has usb and midi out put in put, and when i connect it to my computer ( I’m using FL studio 11 ) and enable it in FL studio but it doesn’t work in there. I check on the keyboard it turned on and light on the midi cable also on, but i notice that the light (Out put) on the midi cable it didn’t turn on, so I don’t know what is the problem with that, is it becoz my keyboard suppose to have midi out and in or becoz of midi cable itself? please help me. And I’m sorry for my poor english. I’m going to purchase an M-Audio or Alesis 88 key MIDI controller soon. I will be connecting it to my PC at home. I have 2 questions, please. 1) Will the quality of sounds as well as polyphony be dependent on my PC’s sound card? 2) Will investing in some high quality speakers be a worthwhile investment? HI, the polyphony depends on the keyboard and good quality speakers are always nice if you can afford them. Hope that helps. Hi Jane, I am having a lot of trouble connecting a Yamaha PSR-275 keyboard to my MacBook Air via the Roland UM-ONE. Only the Midi In light is lit up but both the In and Out jacks are connected. Does this sound like a problem with the cable, the computer, or the keyboard? To be honest I would contact Roland, they have a very good technical help department who will help you trouble shoot, as it is most likely to be the UM-ONE. Or at least you can download the manual and have a good look through at what to expect from it. I have an MTrack Plus and a Casio Priva keyboard. The keyboard has both midi and usb outputs. The MTrack Plus has Midi connections. I am using the M-Track for guitar and bass as well. My question would be is it better to connect the keyboard using the midi through the M-Track or directly to the PC through the USB? The PC is new and has USB 3 inputs and plenty of cpu and RAM. I have a very simple home set up my keyboard is an Evolution Mk-149 it only has midi out. my problem is that I brought a new pc and installed a cheap 6 channel pci sound card just to get a midi port through the joystick plug as pcs don’t come with one now or midi set up in the pcs peripherals bios but this did not work at all apart from the audio side that was fine so I went with a usb midi cable this works but poorly when I use the pich wheel it plays very high notes for no reason and often does not play notes when I use the keys. Thank you for the informative article. I hooked up my Ipad to my Roland FP7 via USb so my son could learn piano via software. The problem i now have is the I can’t get audio out of my Roland anymore. I tried resetting to no avail. Is this a common problem? Any help is appreciated. Hm, I don’t know why connecting it up would mean you no longer got audio. It is quite an old keyboard though, are you connecting it directly up to iPad via the USB? Is it just when connected that you can’t get audio, or has the audio disappeared? I think you may have read the manual very carefully to check if there are any switches or settings you need to adjust, and also might be an idea to contact Roland support directly as this is quite a specific question. In general it is not a common problem as far as I know. You are awesome to answer all these people! I have a Casio Privia PX310. My boyfriend just bought me the M-Audio M-Track Plus with Pro Tools. I have a Toshiba laptop too. I want to use my keyboard to record with my Pro Tools software. I’m reading these answers and am still a lost newbie!! Which cord do I need to connect my keyboard to the M Audio? I do want all 3 to communicate and record. I have midi connection on my keyboard. M Audio has a guitar line connect and a mic input connect. Do I utilize these?? Thank you in advance for your time and considerate patience. So yes, you are using the two guitar/line/mic inputs on the M-Track. Switch to line signal. Wow- Thank you Jane. That was incredibly fast. I will get started with your suggestions and let you know how it goes. I have been using my keyboard as midi in/out through my MTrack express with Pro Tools and Ignite, but am not sure of some things. I can record in Pro Tools, but the play back comes through my keyboard, and not my computer speakers. They are just cheap, computer speakers with no settings. Also, on playback, it only plays the piano sounds which are set/changeable in the keyboard, not the actual recorded sounds. I can record in IGNITE, and playback through computer speakers which plays the actual recorded sounds, but it is so crackly and skips. Can I fix these skips and such? The recording actually sounds good despite this. I was able to get the system plugged in and recording, but now I have a new issue. Perhaps you have an answer? I have an MAudio MTrack Plus, using Pro Tools Express and Ignite software. I have a Casio Privia 310 Keyboard. My computer is a Toshiba Laptop. I am able to record in Ignite, with all the sounds, but the play back is super crackly and it pops a lot. The recording is great and Ignite is super user friendly, but the playback sounds awful. The playback from the Ignite recording comes through my plugged in computer speakers. I have them plugged in the MBox. Any suggestions to fix the pops and cracks? but the playback comes through my actual keyboard, not my speakers. ? Because of this, it plays back the sound that the keyboard is set on, not the sound it was recorded in. So Ignite plays back through the computer speakers, but Pro Tools plays through my Casio Keyboard?? My speakers are cheapy computer speakers. Do I need different ones? Any thoughts you have are greatly appreciated Jane! I have been watching YOUTUBE videos and have not found a solution. My husband and I have been trying to figure out how to get his keyboard to work with Cubase 7. We have hooked up his Kurzweil K2500X with his Windows 7 computer using a USB to MIDI cord, and have plugged everything in exactly how you have said, however, we can not get the program to register that the keyboard is plugged in. We have also tried it with Garageband and tried every USB port, and still have the same problem. I don’t know if you would know what the problem is, but we have tried everything and have been looking online for a few days and have not figured out how to fix the problem, so I thought it couldn’t hurt to ask. Thanks so much for any help you can give! If you find the interface is not working at least you know that is the problem. If it is working OK then another couple of tips: (1) Make sure you have checked the Kurzweil keyboard manual to check there aren’t any settings you need to adjust to make it connect as some keyboards have the functionality turned off by default. (2) Connect all the hardware up BEFORE starting Cubase not after. Thanks for the answer, Jane. Just complementing it, you’ve advised me to stay away from the M-Audio Keystation. I’ve considered the Alesis you suggested, but turns out they’re both synth-action and I’d like some half-weighted with sustain input. What do you think of the Samson Carbon 61? I don’t really need pads, knobs and faders at the moment. Would you advise something else in this category? I have a Samson keyboard at the moment, and very happy with it. The Samson Carbon 61 would be a good choice. iPad ready, easy to connect up via USB, the option of standard MIDI out, sustain port, it’s very well featured and also the Samson keyboards come with a very nice software bundle so good value. (BTW I like the Keystation but since they took off the MIDI port it isn’t as versatile, the Samson is a more modern design as well, with the iPad in mind). 1) Some controllers (I’m gonna stick with a 64-keys one) have the midi out in addition to the USB output and I’ll probably choose one of these since I’d like to try the USB connection with my Mac Pro, but also have the possibility of plugging it in a sound card (that I’m also going to buy) through midi. The point is – don’t I need the sound card if I plug the controller in the notebook USB port at all? 2) If I’m using USB with the notebook intern sound card, won’t I have latency issues that would make me stick with midi through a USB or FireWire sound card? 3) What are my sound output options? Just speakers and headphones or would I be temporarily able to use the notebook speakers? Thanks a lot and sorry for such a long issue. Why not hedge your bets and buy a USB MIDI controller that also has a standard MIDI out port. That way you can use the controller straight away with your notebook but if in future you want to experiment with upgrading to an interface with MIDI i/o then you can direct the output of the keyboard to the MIDI interface. I use a USB-MIDI controller and don’t seem to have any particular issues with latency. It’s a Samson, and many of their keyboards have standard MIDI port, as do the Alesis Q and QX series. Stay away from the M-Audio Keystation. You can just use your built in sound card for now, the Mac Operating System is very efficient and I am sure you will get good results just with your notebook speakers. By the way, most keyboards around the size you are talking about have 61 keys (5 octaves plus a note). No, if it is USB only then it is not possible to connect it to the interfaces you mention. But you should find it will work fine alongside whichever interface you pick. I use an Avid Fast Track and a USB MIDI controller and don’t experience any problems. As it is only a controller it will not have any effect on the sounds you make. Hi Jane, I have a Technics KN1200. My disk drive quit working, and I couldn’t get it repaired as the guy said they don’t carry the parts anymore. I bought a USB to Midi cords but my question is how do I play my midi files? do I need some special software to play it from my computer through my keyboard? Yes, I suggest you seek out some simple software that will open and play back MIDI files with the option to change the MIDI device so that you can choose your USB-MIDI interface and thus play back the file through your keyboard. Your choice is going to depend on what else you’d like to do. It will be better than trying to play back using the built-in Windows player as you don’t have any control over the playback and it defaults to the built in windows wavetable synth. Hi Jane, is it possible to download sounds like cp 80, or cool galaxy into my Yamaha keyboard? Without knowing the model I don’t know if it has such capability, best to consult the manual of the keyboard. If you don’t have it then you should be able to download a copy from Yamaha. I have a Casio Privia PX-150. It comes with the USB to USB option. When I decide to buy a MacBook Pro and MainStage 3 where does the out put come from the digital piano rot eh Macbook Pro? I understand up to the point that I have to turn of the local sounds but where will the sound come from. I have a Kurzweil PC3X and need to fly to a gig. I don’t think I’ll be able to take my keyboard. Kurzweil doesn’t have a computer program for a laptop which would be great to plug into any 88 key midi keyboard. There is no module either. Do you have a suggestion for a laptop so that I can build the sounds I need for times when I can’t take my keyboard? You’d just then need a good DAW to run them from that you were happy with. i want to record songs at my home…using my keyboard of yamaha which have midi function, a kawai digital concert piano and a labtop………..
and how much it will cost to install mic and wiring…..
and also recommend me the softwares easy to use…………. That is a pretty broad question. I would start with getting a decent audio interface with quality XLR microphone input (with phantom power support) and MIDI i/o and line in so that you have covered all the bases for the inputs you will need. If you have not done this kind of thing before then Mixcraft is a good starting point (you can download the demo from acoustica.com) or one of the entry level cakewalk products. They have a less steep learning curve that some of the other packages and it does seem that you are just starting out. For good quality vocal recordings you will want to look for a good large diaphragm condenser microphone. You will also need a stand, a shockmount if you can stretch to it and you might want to think about a small stand mounted vocal booth (see the range from Editors Keys who do a complete range). Hope that helps a bit. I have a kurtzweil 2500 keyboard connected to an old laptop with a midi cable and a multimedia card PCMCIA -not a usb. The card is damaged and I can not seem to find another – ebay searches etc come up with nothing. Since my laptop and keyboard do not have usb connection do you have a suggestion or solution for me? Hi Jane, I need to connect my laptop to my Yam keyboard. I use Notation Musician software to play my music selections. Problem, I need to listen to the music via the keyboard and not the laptop, this way i only need one set of earphones. Hi, if you use a MIDI-USB interface and connect up both the MIDI in and MIDI out then you should be able to set the keyboard as the MIDI output device in the software and therefore get the sound playing back out through the keyboard. I am not actually familiar with Notation Musician software specifically but that is how most applications would work. Depending on the keyboard sometimes you can just make a USB connection direct to computer and it has built in interface. Check the manual. I have a Yamaha PSR 6700 keyboard. I’ve had it for over 20 years. I love it and would not trade it for today’s short-lived electronic instruments. I had a music synthetiser to go with it via a MIDI cable. One day, the synthetiser stopped working. I sent it away for repair. Used it for a few months and it blew again. I have since tried to buy another synthetiser but haven’t been able to find one. The synthetiser I am talking about is a kind of a stand alone black box that connects to the keyboard via a MIDI cable and it usually has over 200 voices that can be played on the keyboard or even blend with the keyboard own voices to bring out an incredible combinations of beautiful sounds. Since I’ve been without an add-on synthetiser I’ve tried to find one and each time I did, those electronic instrument shops keep telling me that they don’t have any of those, “Old technology…” they said. I am here to ask you if it’s true that there are no stand alone synthetisers that connect to older keyboards via a MIDI cable? If there are, where can I find them? Thanks. Hi Michael, Although many people have moved to using virtual instruments on their computers for this kind of thing there are plenty of hardware boxes out there, new and secondhand. Try a search on ‘MIDI sound modules’ and quite a few come up. I quite like the look of the Roland SonicCell, or the Chord Pianobox II has a nice set of GM intruments. Nord do a lot of tabletop synths. I guess it depends on the kind of sounds you want. There are plenty of secondhand bargains up for grabs on eBay, these come up in the Google Shopping search and of course directly on eBay. But the good news is yes, you can definitely still get them! Thank you Jane. You sure know where to look, yes? I checked the Roland BK-7m and the Integra 7. I am not sure if these can be connected to my Yamaha PRS 6700 keyboard and that they will work for years without burning themselves out, like my previous sound module (synthetiser). I will contact Roland and see what they say. You don’t want to be on stage singing and playing an instrument and all of sudden the module cooks itself out and the crowd starts throwing tomatoes and cabbages at you, do you? So, I better treat the next purchase more carefully. Thanks for suggesting a product for me. I’m from Melbourne, Australia. Hi, glad you found it helpful. Probably the best thing is to look through our checklist of things to think about when looking for a MIDI keyboard to find one that fits your needs. If you stick with a good brand then check out the secondhand market too, as they are pretty simple and I have a couple of good quality keyboards (from M-Audio) that have lasted years. I don’t know enough about what is available in India to comment which would be the best keyboard for you, but hopefully the pointers in that article will help you to decide for yourself. Good hunting. My name is Ayo, i am a pianist. Pls i want to be able to use sound synthesizing software on my laptop to play my keyboard sound. Can i do that using a midi-usb cable alone or i have to get a midi box? If you want to use your keyboard as a controller, and get the sound coming from the software on your computer then you should just be able to use a MIDI-USB cable and get the result you want. BUT if you actually want to record the SOUND your keyboard is making then you will need to refer to our article on recording the audio signal from your keyboard as you need different hardware to achieve that. Hi Jane! I am confused by the previous poster wanting to “use sound synthesizing software on my laptop to play my keyboard sound”. Does this mean taking the sound that the keyboard has and synthesizing it by running through a computer software? I just don’t understand. I think the sounds on my keyboard are varied enough, but in addition to the basic operating manual, which I struggle with, a HUGE book (about changing all the parameters of the sound waves et al) also came with it and I am overwhelmed by even the thought of trying to read it again. I have a Juno-Gi and some Roland RD300SX and RD300NX stage pianos. All I have done so far is plug the 300 OUT to Juno In and use Juno sounds. It works on the RD 300SX and I love that I can also add to the mix by playing directly on the Juno while someone else is playing the 300 through it. However, the set up does not work properly and does weird stuff when using the RD 300NX. I want to begin to enter into Noteworthy Composer the easy way. So far, I have written about 300 pieces using the computer keyboard, and look forward to any help I can get. Hi, some people really like the sound of their hardware and want to record it. Other people want to use their hardware as a controller and use virtual instruments in the software to make the sound. The hardware is then just used to record the performance data (ie the notes played etc). If you want to use Noteworthy then you need to get your keyboard operating as a MIDI controller, and you should be able to hear what you have done via the software. Hi Jane! I purchased A midi keyboard that has two outputs: 1. usb 2. midi out. I’m using A Mac pro and A Native Instrument audio interface. and I want to get it to work on Sibelious. When I connect the keyboard using A midi cable to the audio interface (midi out to midi in) the keyboard doest get power to work. If I connect it directly to my Mac with the UBS output, It works, but I can’t seem to hear It through the audio interface, but only through the laptop’s speaker? is there A way for the keyboard to be powered through the audio interface? or to be connected only to the laptop but still to here it through the audio interface? The audio interface is Audio Kontrol 1 by N.I, and the keyboard is Carbon 49 by Samson. Hi, you should be able to configure your software so that it uses your audio interface as the default device, rather than the USB keyboard. You will also have to make sure that you are using the audio interface as the default audio output. You can configure these settings within the software if you look under ‘devices’ or ‘edit preferences’ or however it is accessed. I would love for u to come pay me a visit at my studio, i would learn alot from u jane. Haha! Well feel free to post any questions you have here and I’ll see if I can help. Probably not, MIDI controllers generally are ‘dummy’ keyboards in that they make no sound themselves. So unless it has onboard sounds then no. hi sorry this is long waited and late but i have an older casio keyboard specifically a casio ca-110 and it only has an output midi no input that i see so how can i put this keyboard to my computer so i can use it for software? I have installed garageband, lmms, and mixcraft so im seriously confused and worried it may not pick it up. Hi, it doesn’t matter if it has MIDI in as well as MIDI out, if you just want to use it as a controller, you can still use a MIDI-USB interface. Just only connect the one MIDI port up. It should work fine. The software will recognise the interface and thus any signals sent through it from the keyboard. Make sure you have a power supply for the casio, it will not be powered by the MIDI-USB cable. I think the MIO is working if Logic recognises it. However it will not power your axiom. You will either need an external power supply for your axiom (an optional extra) or you will need to connect up the USB cable from the axiom to power it. As the Axiom is a USB controller keyboard, I am not sure why you would wish to use the MIO with it? It’s not necessary. Hi, Jane what do they call a cable which connect from Keyboard to PC? Hi, I assume you are talking about a USB-MIDI interface? I have a keyboard with USB midi, but my old Atari ST only has the 5 pin DIN connectors for midi. What to do ? how can i fix the delay or latency issue on my laptop? im using roland a49 with sonar le daw in my HP laptop. im having this delay sound coming off my laptop…. hw can i fix this?